Betta fish life span is based on a few simple factors. Environment, diet, genetics and a little luck all play a role in how long your betta fish will live. 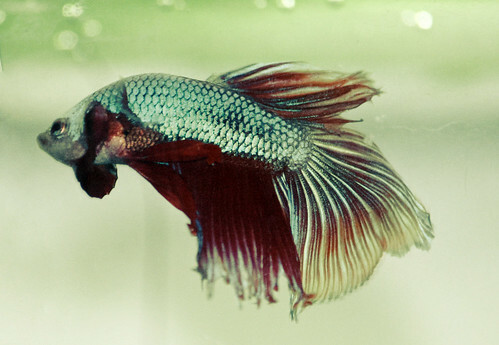 Domesticated bettas, when cared for properly, have an estimated life span of about 3 years. It is not unusual for a betta to live longer than 3 years, but most bettas succumb to disease early due to factors like poor water quality, inadequate diet, inappropriate housing, or accidents. When conditions are right, your betta may live as long as 5 or 6 years. Some fish keepers claim to have even older bettas but such claims haven’t been cohobated (as far as I know). Even Wikipedia’s latest Betta splendens page says bettas can live 7-9 years when fed anabolic steroids. This statement causes me to raise a very skeptical eyebrow and I’d love to see the evidence. With fish that breed so proficiently, I’m not sure why any breeder would even want to go down that road. I suspect this is one of those crazy internet rumors spread by someone who doesn’t really know a whole heck-of-a-lot about betta fish. But hay, I’m all about sharing the latest, so if I hear differently you’ll be the first to know. If you find that your betta fish aren’t surviving long (less than a few years), I’d encourage you to look at three of the four factors you DO have some control over. Environment – Fish are very sensitive to any change in their environment. Recreating an ecosystem in a bowl, with all the elements, minerals, bacteria found in nature, can be tricky, but not impossible. Your betta’s chances of survival will increase significantly if you cycle your aquarium and test your water parameters regularly. Diet – There are many wonderful options when it comes to betta food, but a well-balanced, nutritious diet is key. Live and frozen foods are the closest thing to what bettas eat in the wild. Offering a variety of live and frozen fish foods will put your betta on the right track. You can supplement your betta’s diet with pellet, freeze dried, and flake fish food, which have been treated with vitamins to offer well-balanced nutrition. Genetics – You have less control over genetics, however, I personally have found that fish I have purchased direct from a reputable breeder have greater resistance to infection than many of the big box store bettas. There are ALWAYS exceptions to this rule, but if you are having bad luck with your Walmart fish, try buying direct from a breeder. There are never any guarantees, but you might have better luck trying new sources. Luck – Well, there isn’t much you can do about luck but you know what they say about the Lotto? You can’t win if you don’t play; so get out there and find yourself the perfect betta fish for your family. Untitled, originally uploaded by prismaviolet. I think these four aspects are not just suitable for better live of fishes but also for some other creatures. Thanks so much for sharing. I think the biggest contributing factor for bettas to survive is the environment. Countless occassions when I’ve seen people putting their bettas in small fish bowls or dirty water. But as the saying goes, luck trumps all! actually, evidence shows that high quality bettas (and not mutts from petco) live on average (with proper care) 10 YEARS! My Betta lived for 7 years! He was cool. I didn’t do much either and changed the water not nearly as much as I know now. Guess he was a strong one! Everybody says you need at least 5 gallon, but ive had mine in a 1/2 gallon for maybe a year. Just from walmart. 2 pellots a day and after what ive heard on here so far mine probly shouldve died a long time ago. Just luck? I have a betta I picked up at our local aquarium shop. A little crimson half moon. He’ll be 6 years old here in the next month. From what I’ve gathered he’s a senior on the betta stand point. He’s still pretty active, good appetite, and his fins are fine, but his colors aren’t doing great these past couple weeks. That is my only worry. I do cycle and test my tank (10 gallons and he has a clown pleco he gets along with ), he has a combination of freeze dried food and hikari pellet food, but I’m a little worried. ive had carlos for 6 months, i got him in a disvount store for 1.99, he’s in a starter tank and he loves it! I have had Oscar for 3 days now, he is a twin tail half moon beta. he has a 5 gallon tank. and he absolutely loves bubbles! He was very excited to get in his new tank! And with the proper are he will survive just like that! My fish died 1 day ago and have only had it fo like 2 months ago!!! !i demand a refund!!!!!!!!!!! my Romulus is 8… this month, but I think this may be the end… he has started sleeping at the top, on his side. And I am not gonna lie, he has not had the best life…. when I got him it was for my 2 year old class in a daycare I worked at. The children knocked him off the shelf 3 times in one year… and one 2 year old even picked him up… and if you know anything about 2 year olds, they are not gentle…. he has lived out his last years in the comfort of my home… when I quit the daycare… I was not living my fish, for them to kill…. but hey.. 8 years… yeah… hes definitely a survivor. can u please help me on how i feed my betta fry ?? any substitutions for natural foods?? Hello, my Betta fish is all of a sudden very VERY bloated although there is no pine coning of the shells. He is still eating as normal but can t fit through his normal areas he tries to go through. I feel bad for him because at timez it seems like it is quite a struggle for him to swim really fast. He does still have huge outbursts of energy though, just seems as though he is uncomfortable, i have been feeding him dry pellets. One side especially is very bloated, but like i said he can still swim. I would really like some help. Thanks!